Speedweeks at Daytona and the start of the 36-race NASCAR season is quickly approaching. The sport offers several ways for bettors to cash lucrative tickets, but handicapping the sport takes a multi-faceted approach. Speedweeks at Daytona and the start of the 36-race NASCAR Cup Series season is quickly approaching. The sport offers several ways for bettors to cash lucrative tickets, but handicapping the sport is multi-faceted. Not to worry, BetChicago is here to help educate bettors new and old on the complexities of the sport, beginning with the basics and moving to a more advanced approach. ## NASCAR betting basics Up to 40 Cup Series drivers can qualify for a race, but outside of seven races per season, roughly only 12-14 drivers have a realistic chance of winning the race and even fewer have a shot to win a championship. This is largely due to the superior equipment and funding some teams have over others. Drivers for [Joe Gibbs Racing](https://joegibbsracing.com/team/), [Team Penske and Wood Brothers](https://www.teampenske.com/drivers/#tab1), [Stewart-Haas](https://www.stewarthaasracing.com/), [Hendrick Motorsports](http://www.hendrickmotorsports.com/) and [Chip Ganassi](http://www.chipganassiracing.com/Drivers.aspx) have the most sponsorship funding and thus better and faster equipment. In certain events, such as restrictor-plate and road course races, the chance for a long-shot winner improves greatly (more on that below). Restrictor plates are less of a factor this season than they've been in the past, however. Restrictor plates are going away as part of a sweeping aerodynamics change in NASCAR, but they'll be used for all races at Daytona's Speedweeks including the 500. When gambling on NASCAR week to week, bettors can choose from a variety of markets. These include betting one driver to win the race outright; betting one driver to beat another in a head-to-head matchup; betting a driver to finish first among a group selected by oddsmakers; and betting on which manufacturer will field the winning car. NASCAR futures markets are also available to bettors, including [odds to win the championship](https://www.betchicago.com/odds-to-win-2019-nascar-cup-series-championship-team-changes) and Rookie of the Year Award. Some offshore sportsbooks offer props on whether a specific driver will finish higher or lower than a certain number, similar to a win total in football, basketball or baseball. Like in all sports, bookmakers adjust lines in the days leading up to an event, so it's important for bettors to pay close attention to practice speeds and qualifying ahead of the race. NASCAR.com, Fox Sports, NBC Sports and [JeffGluck.com](https://jeffgluck.com/) are great resources to track news and driver features. [DriverAverages.com](https://www.driveraverages.com/) and [Racing Reference](https://www.racing-reference.info/) are great for statistical breakdowns, while former sportsbook director Micah Roberts posts press and statistical releases for bettors on [his personal blog](http://robertsnascarnotes.blogspot.com/). BetChicago provides weekly race previews with full betting breakdowns of each race. This season, that begins with [Sunday's exhibition Advance Auto Parts Clash at Daytona](https://www.betchicago.com/betting-nascar-clash-daytona-rules-drivers-odds-key-stats-picks). ## NASCAR's best drivers Last season, Kevin Harvick, Kyle Busch, and Martin Truex Jr. accounted for 20 wins in the 36 races, but it was Joey Logano who captured the championship at Homestead in November. For most races, those four drivers will have odds shorter than 10/1. Chase Elliott, Ryan Blaney, Erik Jones and Kyle Larson are some of the sports' young stars, but Larson has never won a Cup race on a 1.5-mile track, a serious concern considering 12 races this season are run on such layouts. Clint Bowyer, Denny Hamlin, Kurt Busch, and Jimmie Johnson are the sport's wily veterans but have lagged the past two seasons with just nine wins combined. Ford's trio of Logano, Brad Keselowski and Ricky Stenhouse Jr. have been dominant at the restrictor-plate tracks of Daytona and Talladega, but as previously stated, restrictor plates will be use only at the Speedweeks events at Daytona this season. Chevrolet has been better on shorter tracks and road courses but struggled for the most of the 2018 season. Toyota's Joe Gibbs Racing team of Kyle Busch, Truex, Erik Jones and Denny Hamlin boasts the most talent moving forward. Below is BetChicago's ranking of the top-20 drivers for the 2019 season. No 1. Kyle Busch (Toyota) No 2. Kevin Harvick (Ford) No 3. Martin Truex Jr. (Toyota) No 4. Chase Elliott (Chevy) No 5. Joey Logano (Ford) No 6. Kyle Larson (Chevy) No 7. Brad Keselowski (Ford) No 8. Erik Jones (Toyota) No 9. Ryan Blaney (Ford) No 10. Clint Bowyer (Ford) No 11. Denny Hamlin (Toyota) No 12. Aric Almirola (Ford) No 13. Jimmie Johnson (Chevy) No 14. Kurt Busch (Chevy) No 15. Alex Bowman (Chevy) No 16. Ricky Stenhouse Jr. (Ford) No 17. Daniel Suarez (Ford) No 18. William Byron (Ford) No 19. Ryan Newman (Ford) No 20. Austin Dillon (Chevy) ## Track types and similarities to look for While all tracks are created differently, certain ones have common characteristics in length, banking and setup. Drivers often have success using a similar car setup at tracks with common characteristics. For example, New Hampshire Motor Speedway is a flat, 1-mile track most similar to Phoenix and Richmond, and it's a larger version of Martinsville. Researching past results and recent speed charts across common tracks is effective when handicapping each one independently. Here is a list of comparable tracks: __1.5-mile tracks:__ Homestead, Texas, Kansas, Las Vegas, Darlington (1.3), Kentucky, Atlanta, Charlotte, Chicagoland __1-mile tracks:__ Phoenix (ISM), Dover, New Hampshire __Road courses:__ Watkins Glen, Charlotte Roval, Sonoma __2-mile tracks:__ Michigan, Auto Club __2.5-mile tracks:__ Indianapolis, Pocono __Ex-restrictor-plate tracks:__ Daytona, Talladega __Short tracks:__ Martinsville, Richmond, Bristol __MORE:__ [NASCAR similar track guide](http://ifantasyrace.com/fantasy-nascar-similar-track-guide/) Road courses of Watkins Glen, Charlotte Roval, Sonoma, and the large tracks of Daytona and Talladega have a history of long-shot winners that specialize in the unique style of racing. For example, AJ Allmendinger is known as a great road course driver, while Hamlin is known as a better pack-racer, which could help him be a sleeper this season as NASCAR implements a sweeping aero rules change designed to foster tighter racing (see below for more details). 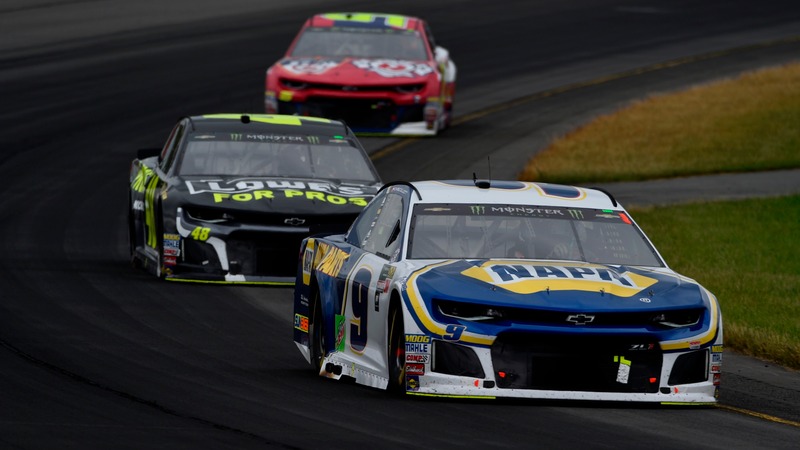 __MORE:__ [How to handicap the Roval at Charlotte](https://www.betchicago.com/nascar-roval-charlotte-betting-odds-longshot) ## Important NASCAR stats to know NASCAR provides its followers with updated loop-data for a variety of key stats in different categories, potential ticket-cashing information for bettors. Below are several key stats to know. __Average Running Position:__ Sum of driver position on each lap – divided by the laps run in the race. __Closers:__ The number of positions that a driver improves over the last 10 percent of the race. __Consecutive Laps with a Pass__: Number of consecutive laps with at least one pass. __Consecutive Passes without Being Passed:__ Number of consecutive passes without being passed. __Fastest Drivers by Straightaway:__ Ranks each driver by average speed on each straightaway. __Fastest Drivers by Turn:__ Ranks each driver by average speed in each turn. __Fastest Drivers Early in Run:__ Ranks each driver during the first 25 percent of laps run in a typical full green flag segment. __Fastest Drivers Late in Run:__ Ranks each driver during the final 25 percent of laps run in a typical full green flag segment. __Fastest on Restarts:__ Shows average speed on the first two laps under green flag conditions. __Halfway Home:__ Compares the race standings at the halfway point of the race with the final results. __Laps Driver Improved Position:__ The total number of laps during a race where a driver improved his position. __Passing Breakdowns:__ For each driver, shows how many and what percentage of passes were made by each turn and each straightaway, including the total number of passes for each driver. __Quality Passes:__ The number of times a driver passes another car that is running in the top 15 while under green flag conditions. __Speed in Traffic:__ The speed when there is another vehicle within one car length under green flag conditions. __Time Trailing at Finish:__ The time that each driver finished behind the race winner. Average green flag lap time is used to calculate cumulative time for drivers not on the lead lap. An all-encompassing stat of "driver rating" combines: Wins, finishes, top-15 finishes, average running position while on lead lap, average speed under green, fastest lap, led most laps and lead-lap finish. ## 2019 changes in NASCAR A new year and another new NASCAR rule is causing headaches for bettors and bookmakers alike. NASCAR announced a plan that will now see [race winners disqualified](https://www.betchicago.com/betting-nascar-rule-sportsbooks-disqualify-race-winner) and drivers stripped of finishes on the spot if they fail post-race inspection. Bettors will have to wait an estimated 90 minutes after the race until official results are released by NASCAR to cash tickets. Announced in October, NASCAR is implementing a new aero package designed to reduce horsepower and foster tighter racing for all intermediate tracks' races that could throw a wrench into handicapping races. Attrition from the additional crashes could be likely, possibly leading to surprise winners. Perhaps the most controversial statement came from Kyle Busch, who claimed NASCAR has removed the skill element from racing. <a href="https://www.youtube.com/watch?v=17DPj4bCTO8" class="embedly-card" data-card-width="100%" data-card-controls="0">Embedded content: https://www.youtube.com/watch?v=17DPj4bCTO8</a> __MORE:__ [What we know — and what we don’t — about NASCAR's new rules package](https://jeffgluck.com/nascar-test-2019-rules-package/) Also in 2019, Ford will move to a new Mustang car design and could see an early-season learning curve, similar to what we saw in Chevy's move to the Camaro last season [with just four wins](https://www.racing-reference.info/season-stats/2018/W/). There are a lot of unknowns to begin the season and it could take over a month to really understand how the new rules package will impact racing. [Drivers who attended](https://www.lvms.com/media/news/elite-drivers-ready-for-one-most-important-tests-nascar-history.html) the aero test at Las Vegas Motor Speedway in January could have a leg up in NASCAR's second race of the season in Atlanta and the third race of 2019 back in Vegas. Despite the unpredictability, keeping up to date with the latest driver news, loop-data statistics, track type and similarities, equipment, and prior results will still help cash tickets.